Secure online payments right on your DNN Platform, now with a PCI-validated P2PE integrated solution! Credit cards and electronic checks can now be accepted through the Bluefin Gateway Payment account. Security comes first when we talk about money transactions. Bluefin takes it to the next level with the PCI-validated point-to-point encryption (P2PE), which secures cardholder data and protects your brand. In addition, all PCI-validated providers must undergo strict controls and, consequently, keep a high standard of service quality. 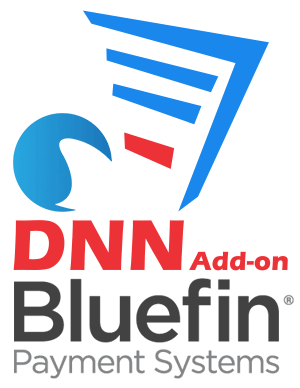 The DNN Bluefin Add-on is compatible with Action Form, Action Grid and DNN API Endpoint. The minimum requirements are DNN 7.2.1 and .NET 4.5. Also, the merchant must have an e-commerce (Card Not Present) Bluefin Payment Gateway account and must be able to store payment gateway account data securely (API Login ID or Transaction Key). We would strongly recommend having a valid Secure Sockets Layer (SSL) certificate and a website able to initiate both client and server-side SSL connections. The first 5 customers will get 25% discount with the following code: BFIN25. Keep an eye on our website, visit the store and read the documentation.